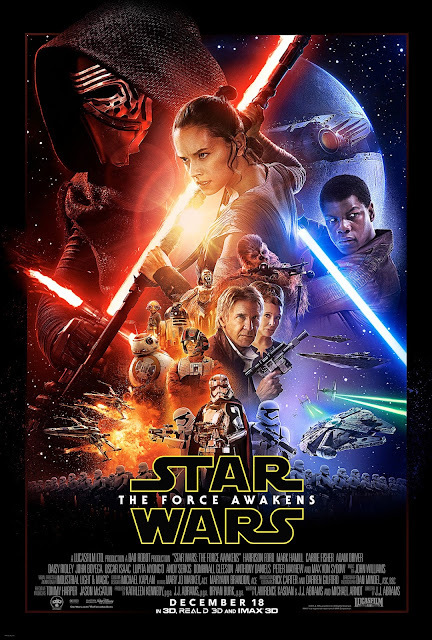 The Force Awakens retains many features that fans adored in the original trilogy, frequently paying homage to it, but also adds new characters and planets, and revitalises many aspects of the earlier films. The end result is a film that fits in perfectly with its predecessors (far more so than the prequels did), but still leaves its own stamp on the franchise too. Unlike the prequel trilogy, creating sequels allows this film to bring back many fan-favourite characters from the original films, and allows us to see what became of them over the years - who didn't get excited when Han Solo and Chewie appeared onscreen again? And they were true to their old selves, their parts written just as they should be, only older and more experienced and wordly, with Han still reckless, Leia still a leader (now with a new title of General), and the droids still adorable. They are now the leaders and also the mentors for the new generation of characters, though it is the new who really take the forefront now. Indeed, we don't see any familiar faces for the first half hour or so of the film - however, they do have important connections to the new characters (but I'll not say too much about that!) and certainly have bigger roles that simply cameos. Rather, they are still integral to the story, as their lives interweave with the new characters. The big risk here was that the new characters wouldn't live up to their predecessors, but luckily they proved to be highly likeable. Rey is the strong 21st century female lead we've all been crying out for, proving herself to be smart, savvy, brave and independent time and time again - for once, the climactic battle is not between two men! Finn's slight awkwardness, strong morality, and relatability also make him instantly likeable, and the two of them have great chemistry, humour and banter between them. Other new characters seem to echo the old ones, with BB-8 filling in for R2D2, Maz Kanata possessing the ancient wisdom akin to Yoda's, and Poe Dameron having an undeniable swagger very like Han Solo (though R2 and Solo are still around! ), though they are certainly not carbon copies of their counterparts - and I really like all of them! Rey and Finn though are even more unique, and cannot be paired off as someone else. Kylo Ren is also fascinating as the new villain, as there is clear emulation of Darth Vader on his part, yet he faces a powerful struggle throughout the film, and his future development will be very interesting to see. I could talk about all of them more, but this review is already pretty long, and I' avoiding spoilers. The plot bears several similarities to the original film, A New Hope, with many scenes and plot points reminiscent of that - this is definitely more in homage to the film though, not simply repetition. And all such scenes have a clear necessity in the plot development of this new trilogy. Of course, we open with the scrolling titles on the starry background, and context for the story, with that iconic theme playing over it, immediately transporting us back into the Star Wars universe once more. With the Empire no more, a new evil had to appear, this time taking the form of the First Order, hell-bent on destroying the Republic. There are many facets to them though, from Kylo Ren to General Hux, but all of it is being controlled by a greater, mysterious being. The fight between light and dark is the driving force of all Star Wars films, as well as the Force and the Jedi, and of course this had to return in the latest instalment. Continually repeating these battles could start to feel tired, but it's the scenes in between and the character development that keep things fresh. There is also more exploration of The Force, as we see stronger powers stemming from it than we ever have before, and there is a new possibility of that elusive balance finally being achieved. Another great thing about the new film is that the dialogue is peppered with more humour, and feels real and modern, removing some of the cornier, melodramatic aspects the previous films were guilty of. And even ignoring the previous films, the script contains so many of the things a good story needs - there's drama and plot twists abound (helped by how little the trailers gave away, unlike so many films nowadays), lots of exciting action sequences, sprinklings of both humour and romance, and one truly gut-wrenching scene, which I will say no more about. The Force Awakens takes us to several new planets in the universe, just as the previous films did, which was fun to see, but I couldn't help wishing we could return to somewhere familiar again. The return of the Millennium Falcon was a great choice though, with its iconic status and legendary history, and the way we see it return was particularly fun. Many other iconic spaceships return, including the X-Wings and Tie Fighters. Even the camera angles, particularly inside the ships, echo the original films, which really helps blend this new instalment seamlessly into the franchise. John Williams returns once again to provide the score for the film, with that iconic theme re-appearing over and over, with those big, dramatic orchestral pieces full of trumpets and strings. Again, reminiscent of the earlier films, and also suits the tone and action of the film perfectly. It's all these little details that are so important in making sure this film is truly part of the franchise, as without them it would feel jarringly different. The years that have passed since the previous films though have been highly beneficial in one key way - the special effects nowadays are infinitely better. Gone are the puppets (which no matter how well-made, were still obviously fake) and poor CGI, now replaced by realistic costumes and make-up, and beautifully rendered motion capture and CGI, to create scenes on alien planets that can hardly be distinguished as not real. Some iconic things, like Chewie and C3PO's costumes have remained the same, but they well-enough made in the first place that they don't need replacing. There's also a much more even mix of costumes and computer generation, rather than relying too heavily on the latter, which no matter how well-done, would start to feel too fake after a while. The Force Awakens successfully avoids the two traps that lay before it - it neither dwells too much in the past, which would potentially feel stale and repetitive, nor does it discard what came before it, leaving fans of the original fans angry and upset. The past and present exist side by side, paving the way for a new generation of characters, and maintaining their connection to the originals. And with two more films in this new trilogy still to come, we can now begin to speculate on what will happen next. While some plot points are fairly clear before us, others remain shrouded in mystery. There are still back stories to be revealed (especially Rey's! ), questions to be answered, and what-are-currently-plot-holes to be resolved, and many characters have several avenues that their stories and development could take. All in all, it's an excellent film, both in its own right, and alongside the existing franchise. And I, for one, am thrilled that I enjoyed it so much, and it is a worthy addition to an iconic franchise - thank god they didn't ruin it!